The food of Jeju adds to the joy of traveling as much as the beautiful scenery. Grilled black pork and fresh seafood ... . And you can’t leave out ’Hallasan’ Soju. Hallasan is the top regional soju brand that represents Jeju. The deep taste of the ‘Hallasan Original,’ bottled in clear glass and with 21% ABV, is best enjoyed at room temperature. 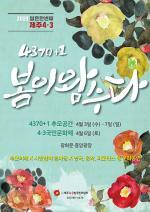 How, then, is Hallasan Soju, best paired with local Jeju cuisine, produced? Last month, Hallasan finished construction of its new plant in Ongpo-ri, Hallim-eup, Jeju-si, and began offering tours of the new factory. The Hallasan Soju Factory Tour is a popular stop for people traveling in the Western part of the island. Tours are offered four times a day (hourly from 1pm-4pm) from Fridays to Sundays, and can be booked online. Admission is free until January next year. From the factory, one can enjoy the view of Biyang Island across the sea on one side, and Mt. Halla on the other. In front of the modern factory, which stands in the beautiful scenery of Jeju Island, there is a wall of the old factory built in 1985. The visitor can appreciate the 70-plus years of history across four generations after the company was founded in the 1950s. The tour starts on the second floor of the factory. The blue interior is inspired by the skies and seas of Jeju. Tour participants ranged from people in their 20s to those in their 60s. 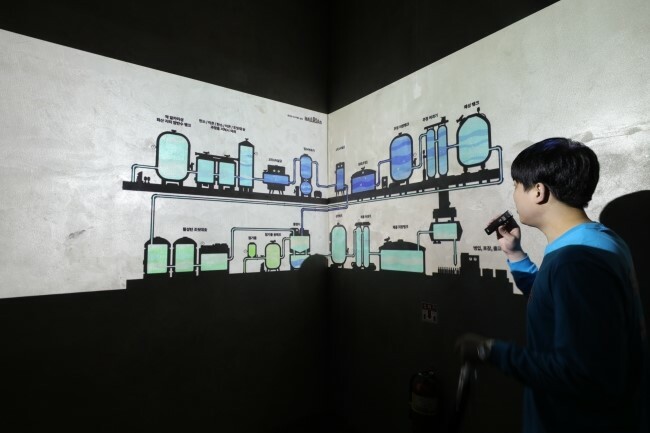 Following the guide, the visitors can take a look at the history hall which chronicles the past and present of Hallasan Soju, a space showcasing the soju manufacturing process, and the aesthetically pleasing water display hall. Visitors can also see the inside of the factory where manufacturing is underway. We watched the process of bottling soju in an automated facility and the process of cleaning the bottles collected from outside. At the end of the tour, you can sample Hallasan Soju with light snacks at the third floor tasting hall decorated like a cafe. Participants were able to make cocktails with Hallasan Soju, and each participant enjoyed crafting and taking photos of original soju cocktails. Ms. Kim Soo-yeon, 24, from Bangbae-dong, Seoul, said, "I expected the factory to have an old feel, but it is actually quite modern and had a lot of elements that young women can enjoy. 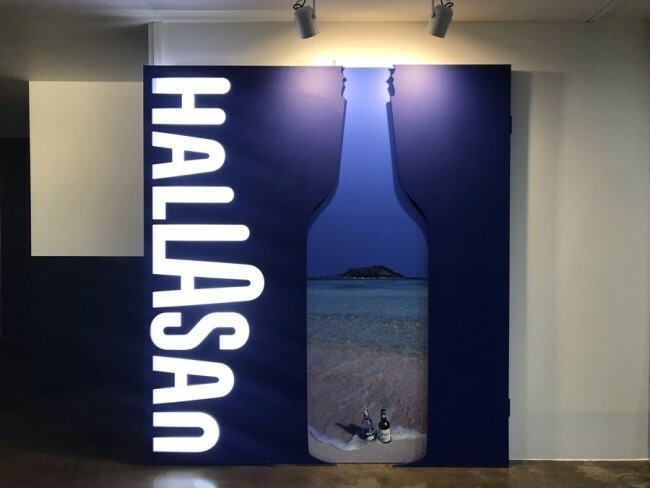 I had the impression that soju can be enjoyed in a sophisticated way, like wine.” The Head of Marketing at Hallasan commented that much effort was put into the tours and the design of the factory since the inception of the new factory, since there was a prevailing sentiment that Hallasan Soju is an old company. “We put a lot of effort to accommodate younger tastes and emphasize the unique culture of Jeju.” The highlight of the tour is the 5th floor roof garden. In the panoramic view of the rooftop of the factory facing the sea, Biyang Island, Hallim Port, and Hyeopjae are all visible. The 3rd floor gift shop is not to be missed, with its range of design products inspired by Hallasan Soju, the factory, and Jeju.